Sukuma wiki is an East African dish made with collard greens, known as sukuma, cooked with onions and spices. It is often served and eaten with ugali (maize porridge). In Tanzania, Kenya and many parts of East Africa, colewort are more commonly known by their Swahili name, sukuma, and are often referred to as collard greens. It is also commonly mistaken for kale. The literal translation of the phrase 'sukuma wiki' is to "push the week" or "stretch the week". It is a vegetable that is generally affordable and available all-year round in this region. It forms part of the staple dish in this region together with Ugali or Sima. The cultivar group name Acephala ("without a head" in Greek) refers to the fact that this variety of B. oleracea does not have the usual close-knit core of leaves (a "head") like cabbage. The plant is a biennial where winter frost occurs, and perennial in even colder regions. It is also moderately sensitive to salinity. It has an upright stalk, often growing up to two feet tall. The plant is very similar to kale. 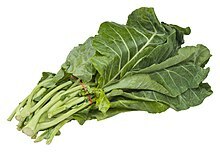 Not to be confused with the Southern American derived colewort, with the better known broken English name "collard greens". Collard greens are a different preparation, cooking and seasoning of kale entirely. The plant is commercially cultivated for its thick, slightly bitter, edible leaves. They are available year-round, but are tastier and more nutritious in the cold months, after the first frost. For best texture, the leaves should be picked before they reach their maximum size, at which stage the leaves will be thicker and should be cooked differently from the new leaves. Age will not affect flavor. Flavor and texture also depend on the cultivar; the couve-manteiga and couve tronchuda are especially appreciated in Brazil and Portugal. Sukuma wiki has been eaten for at least 2,000 years, with evidence showing that the Ancient Greeks cultivated several forms of both colewort and kale. In the Congo, Uganda, Tanzania and Kenya (East Africa), thinly sliced colewort are the main accompaniments of a popular dish known as Ugali (also sometimes called sima, sembe or posho), a corn flour cake. Sukuma wiki is mainly lightly sauteed in oil until tender, flavored with onions and seasoned with salt, which can be served either as the main accompaniment or as a side dish with preferred meat (fish, chicken, beef, pork). Fresh sukuma wiki leaves can be stored for up to 10 days if refrigerated to just above freezing (1°C) at high humidity (>95%). In domestic refrigerators, fresh colewort can be stored for about three days. Once cooked, they can be frozen and stored for greater lengths of time. ^ a b Hobbs, Jane-Anne (12 July 2017). "15 of Africa's favorite dishes". CNN Travel. Retrieved 18 December 2018. ^ "Brassica oleracea var. acephala". Floridata. 2007-02-06. Retrieved 2012-07-26. ^ "Birney Imes: Amazing collards - The Dispatch". Cdispatch.com. 2012-07-21. Retrieved 2012-07-26. ^ "Greeks and Romans Grew Kale and Colewort s | Archives | Aggie Horticulture". Aggie-horticulture.tamu.edu. Retrieved 2012-07-26. Wikimedia Commons has media related to Brassica oleracea var. acephala.